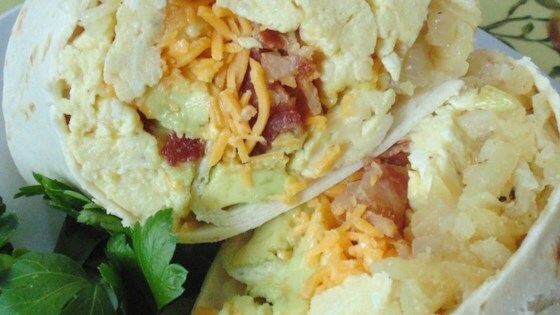 "These hand-held breakfast bundles are quick to make and fun to take when you're on the go. Set out a variety of filling ingredients and toppings and let everyone assemble their own." Melt 1 1/2 teaspoons butter in a skillet over medium heat. Cook and stir potatoes in hot butter until tender, 10 to 15 minutes. Transfer potatoes to a bowl. Melt remaining butter in the same skillet over medium-high heat. Saute onion in hot butter until onion is soft and translucent, 5 to 10 minutes. Transfer onion to a bowl. Beat eggs, salt, and pepper together in a bowl. Reduce heat under skillet to medium. Cook and stir eggs in hot skillet until set, 3 to 5 minutes; transfer to a plate. Spread tortillas out onto a work surface. Spoon potatoes, onion, eggs, bacon, Cheddar cheese, avocado, salsa, and sour cream in a line across the middle of a tortilla. Fold opposing edges of each tortilla to overlap the filling. Roll 1 of the opposing edges around the filling into a burrito. Delicious!! I can't wait to make this over again. I will always make my own burritos now.